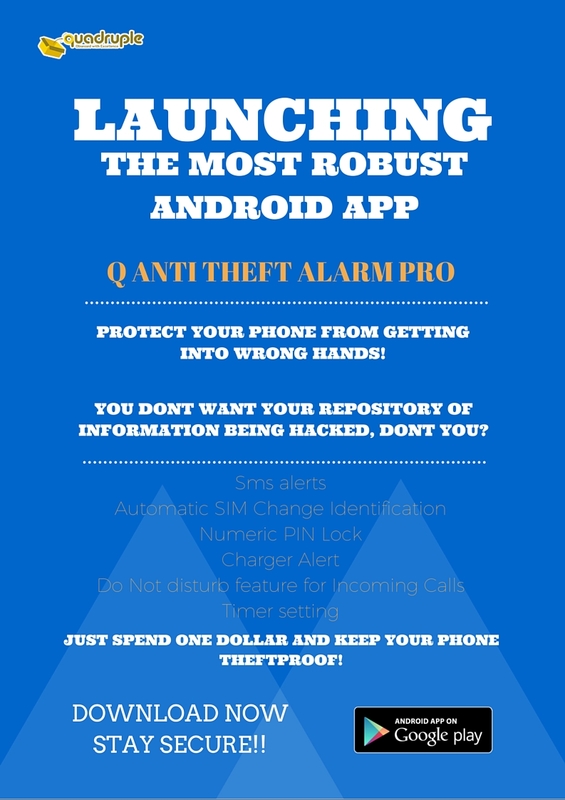 Here is a method that is helping to protect your smartphone from theft! Your smartphone might be the most important device for you as it contains all your contacts, personal data and photos/ videos. Losing your phone means losing all your precious data you have saved for years. There are apps that are developed in the market to safeguard your phone from being stolen and securing the data inside the device. Q-Anti Theft Alarm is a product of Quadruple business services, a young and dynamic set of experienced professionals who ensure creative products with enterprise mobility. This app is designed with some of the selected high security features in the market that could offer maximum security to your phone with minimal actions. The app offers several different options for your phone’s safety. SMS alerts – SMS alerts are sent to your emergency contacts to notify theft or misplacement of your phone. These SMS are very useful to trace your phone with your unique IMEI number. With IMEI no you can block your SIM from being misused. The last seen location of your phone will also be sent as a SMS if the device is GPS enabled. Set your own loud alarm & scare away the thief! The app offers a timer after which you would leave your phone unused. Just set the timer and activate the alarm. Also select a loud ringing tone from your gallery. If someone tries to movie your phone, the alarm will start ringing which cannot be stopped until the ‘deactivate’ option is selected inside the app.